Over the past several years, Neil Bush, the younger brother of President George W. Bush and the son of former President George H.W. Bush, has made several international trips of behalf of the Reverend Sun Myung Moon’s assorted enterprises. In late February, Bush called on Paraguay’s president while in the country as a guest of a business federation founded by the Rev. Moon. Meanwhile, back home, late last year, a number of news reports confirmed that the U.S. Department of Education’s Inspector General was looking into “allegations that federal money is being spent inappropriately on technology sold to schools” by Ignite!Learning, a company founded by Neil Bush. In a statement issued on February 27, headlined “Call for Increased Collaboration in Paraguay,” Dr. Thomas G. Walsh, the Secretary General of UPF, said that Bush called on people to become “transformers of their societies” during a speech at an International Leadership Conference entitled “Toward a New Paradigm of Leadership and Government in Times of World Crisis,” held in late February at the Excelsior Hotel in Asuncion, Paraguay. The conference, following on the heels of one in January in Uruguay, “featured presentations from UPF’s peacebuilding curriculum,” Dr. Walsh’s statement read. Topics included God’s Ideal for Peace, presented by Thomas Field, director of UPI for Latin America; Spirituality and Leadership by Jorge Guidenzoph, President of the Uruguayan National Conference on Leadership; the Cause and Origin of Conflicts, by Ricardo de Sena, Director of UPF’s Office of UN Relations; the Principles of Reconciliation, by Dr. Antonio Betancourt, director of UPF’s Office of Government Relations; and Character Education, by Lic. Jesus Gonzalez, President of the International Educational Foundation. 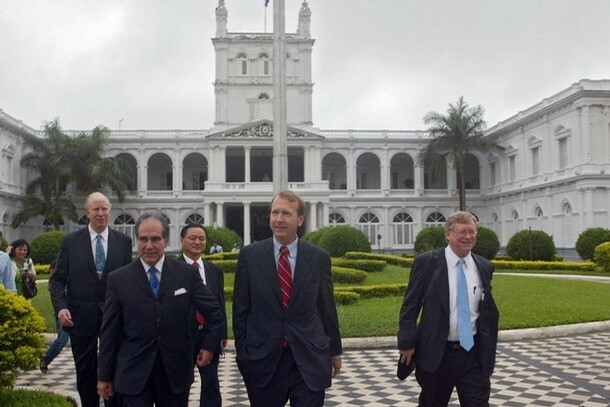 A photo from Getty Images by AFP/Getty Images showed Neil Bush leaving the presidential palace after a meeting with President Duarte on February 28, 2008. On the far right is Larry Moffitt who is the Vice President of editorial operations for United Press International (UPI), a news service owned and operated by Rev. Moon. The story goes like this: George W. Bush and/or George H.W. Bush bought hundreds of thousands of acres in Paraguay, adjoining a similar spread owned by the Unification Church’s Rev. Sun Myung Moon. Both massive parcels are hidden within a remote South American wilderness atop the world’s biggest freshwater aquifer adjoining a secret U.S. military airbase. Oh, and there’s a special non-extradition law to protect the Bush/Moon families as they enjoy their old age and run drug/weapons smuggling rings, safe from American justice. And they’ll own all the drinking water in the world, or something. At home, Neil Bush is best known for his 1980s involvement in the Silverado Savings and Loan debacle, which cost taxpayers more than $1 billion; the lurid details of a messy divorce from Sharon Bush, his wife of 23 years; and his mother Barbara Bush’s shameless demand that her contribution to a Hurricane Katrina relief foundation, working with those who had to be relocated to Texas, be used by local schools to acquire Ignite! products. Ignite sells what it calls a “Curriculum on Wheels (COW),” a cart-mounted video projector and hard drive loaded with video content to help teach math, social studies, and science, which costs about $3,800, not including yearly costs for licensing the content, eSchool News pointed out. “While Ignite! Learning welcomes accountability for ensuring that public school expenditures are in compliance with appropriation guidelines, Ignite! Learning has no knowledge of any customer that has procured our curriculum solutions through means which are other than completely ethical. Bill Berkowitz is a longtime observer of the conservative movement. His column, "Conservative Watch," documents the strategies, players, institutions, victories and defeats of the American Right. Read other articles by Bill, or visit Bill's website. This article was posted on Monday, March 31st, 2008 at 5:00am and is filed under Corruption, Paraguay, Religion, Right Wing Jerks, South Ixachilan (America). Jesus what a sordid clan! Don’t forget Jeb’s little insurance scam back in the ’80’s. Check out Kevin Phillips’ book on the Bush dynasty. And nobody pays any penalty for anything! WHEN WILL WE SAY ENOUGH IS ENOUGH…..PROSECUTE THEM ALL…..NOTHING BUT CRIMINALS…..
Ah! Neil Bush of the S&L debacle. He should have been in jail, doing from now on. for his role in that mess. Must be in league with “devil” or something. Oh, thats right, The Rt, hon rev moon. Iwonder if rev moon stiill owns a large share of the Washington Times newpaper..They have always been bush backers. Hmm? What a mean-spirited report! If you read the actual facts in your own report, all the people you have accused of devious motives (without proof) are in fact trying to do things like bring peace and educate people. This kind of writing used to be called slander, back in the days when journalism had standards. Who is Bill Berkowitz? What are his motives? Why does he bear false witness against Rev. Moon and conservatives? Is it because the morals of the religious right challenge his immorality? Is it because he has a homosexual and Marxist agenda? Let’s look at the facts: Mr. Berkowitz uses the same tactic of bearing false witness that both Lenin and Hitler used. These twisted individuals preyed on the ignorance and base resentments hidden within the masses. By inciting mobs with lies, they tricked people into believing the solution to the evils of the world were within their reach — if only they trusted in Lenin or Hitler. The true solution: Reverend Moon understands the extent that evil works within individuals. (Selfishness.) It is a force that easily deceives because of the spiritual ignorance of people. Religions have yet to fully understand the trickery of this force. Consequently, religions have continued to fail in accomplishing its ideals. It is this failure that Rev. Moon wants to fix. It has nothing to do with drugs or money as Mr. Berkowitz insinuates. It has everything to do with the love Rev. Moon has for people. But Mr. Berkowitz can’t perceive this because of the hatred and resentment (the manifestation of his selfishness) that clouds his mind. What is at stake in the world? The true war taking place in the world today is that which takes place within the mind of people. All people have evil traits of some degree or other. As long as such evil exists within a person, that evil will resist goodness. Scapegoating will not rid the world of such evil. Only by the recognition of that hidden evil within ourselves — and it’s defeat by our own conscious effort — will we be able to truly end evil and injustice in the world. Too bad for the Bushes and the Moonies–the people of Paraguay threw out the RW regime of 60 years recently and elected a resigned Catholic Bishop, a left oriented populist, as president! No more safe haven for Bush and pals to flee to and escape prosecution for their crimes! They will no longer be safe from extradition on their cozy 98,000 acres! And as for Moon and his BS about “peace”–give me a break! As for Neil’s hunk-of-junk education software, teachers in Pinellas County FL have written letters to the editor declaring it “junk” which just sits in great piles in storage, and bought by the county under political pressure! If it’s a Bush, it’s fraudulent, rest assured! Cause birds of a feather flock together. Barbara, you have done one heck of a job raising your “four felons”!! !